The hoop is a important symbol to many Native American tribes and for some the hoop dance is a healing dance. The hoop can be used to represent many things but essentially the hoop symbolizes the never-ending circle of life. It is a dance that can amaze and delight you as in Brian Hammill's performance below. Dancers incorporate between one and 30 or more hoops in the dance, which are used to create both static and dynamic shapes, or formations, representing various animals, symbols, and storytelling elements. The solo dancers use their numerous hoops to represent eagles, butterflies, snakes, etc. Hands are used far more than hips; hoops do not swing around bodies but are moved carefully from formation to formation. Native American hoop dancers live throughout North America. A few even live elsewhere. Hoop dancers vary in the way they see their hoops and their dances. Some might think of hoops as sacred. Others might see them simply as dancing accessories. Dancers (or their families) make each hoop by hand. * it is a connection to the past. According to writer Basil H. Johnston in Anishinaabe culture, a Manitou named Pukawiss, brother of Nanabozho, and born to live amongst the people, created the hoop dance. Unlike the other boys, Pukawiss did not show an interest in running, swimming or hunting. He only wanted to watch the animals. His fascination with them drove his father's interest away from him towards his brother Maudjee-kawiss therefore leading everyone to call Pukawiss: the disowned or unwanted. Pukawiss learned so much about life in the movements of eagles, bears, snakes that taking their life would have been wrong. The animals had much to teach the humans about values and relationship like loyalty, kindness and friendship. Pukawiss taught his village about the animals by spinning like an eagle in flight or hopping through grass like rabbits or bouncing like a baby deer. He became a dancer. So many villages wanted him to teach them about the ways of the animals that he had to give up his home and became a permanent visitor. Many women wanted him to settle with them in their village but he preferred to keep moving. Like his father, his brother Maudjee-kawiss did not understand Pukawiss's artistic ways and sought to scold him. Pukawiss often provoked his audience by teasing them. As an older brother, he teased his other brothers perhaps once too often. Insulted by a Pukawiss prank involving the theft of his prize pigeons, Nanabozho angrily razed the mountain under which Pukawiss had been hiding camouflaged as a snake. Pukawiss wasn't dead but now he had a new job: to taunt those who are too proud. The Anishinaabe believe that we see him each time the wind teases the leaves and soil to dance. Brian Hammill, the dancer here, was born of the Ho-chunk Nation from southern Wisconsin and is a proud veteran of the United States Army. He is an accomplished hoop dancer, constantly ranked among the top 10 in the world. His performance includes many intricate manoeuvres creating various symbols significant in his life. He was born and raised in Benton, Wisconsin and now resides in Phoenix, AZ. He has been Hoop Dance World Champion many times. 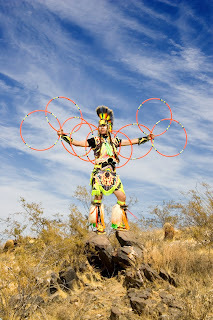 In this video he gives his own introduction to the hoop dance. Enjoy what the hoop dance has to offer you. My wish is that you find in it your own healing.